A Tasty Vegan Food Blog with lots of Food, Recipes, Reviews and a Whole Lot More! You are currently browsing the tag archive for the ‘tofu’ tag. Hey everyone! I couldn’t blog yesterday because my Internet was down, Anyways yesterday I made some Eggplant Caponata from The Mediterranean Vegan Kitchen Cookbook. Now this is my second time making Caponata. The first time I made it how the Mediterranean Vegan Kitchen Cookbook says to which is roasting the eggplant. This time I fried the eggplant which is the more of the traditional way of making caponata and I also used balsamic vinegar and some red wine vinegar instead of just red wine vinegar. I liked the eggplant caponata that I made yesterday but I really prefer the pre roasting the eggplant vs. frying the eggplant. I found that frying the eggplant made the caponata really heavy. I couldn’t eat it all because it was so heavy! I just wanted to try frying since its more traditional and I was little on a hurry, but roasting is way way better!! 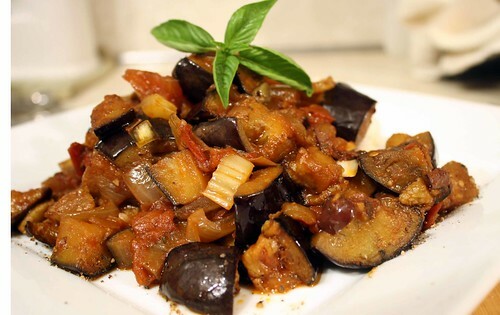 Eggplant caponata is fairly easy to make. You pre roast/fry the eggplant. Make the sauce with tomatoes, onions, garlic, cook it for 20 minutes. Add the vinegar, sugar, tomato paste, olives, and capers. Throw it all together and cook it for another 10 minutes and you’ve got yourself Eggplant Caponata. Today I took the leftover Caponata and turned it into a pasta dish which I always do for leftover vegetable stews. I’ve been having a lot of pasta lately, nearly all my posts have some pasta dish in it. I can’t help it, its so good and easy, but I think I should take a break from pasta for a while. One thing I miss during my prevegan days is feta cheese. I loved feta cheese. Thankfully I found an awesome recipe for vegan feta cheese. I used Bryanna Clark’s recipe for Tofu “Feta”. This recipe is amazing!! It reminds me of the feta cheese that I had during my prevegan days. It is so so awesome. It is really easy to make too. You should definitely try Bryanna’s recipe, Bryanna has such awesome recipes!! 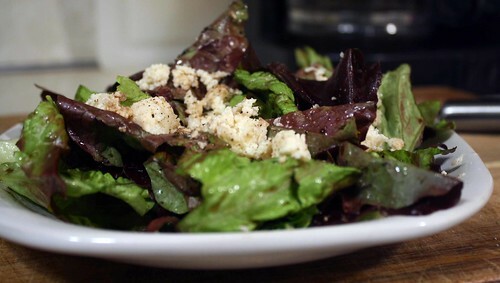 Thank you so much Bryanna for making such a great recipe for Tofu “Feta”! Today I used my Tofu “Feta” in a salad. I just can’t believe how close to cheese the Tofu “Feta” tastes, it has a very creamy taste to it! Cut the Tofu into about 6-8 slices. Mix all of the ingredients together in a bowl. Add the tofu and mariante for about an hour. Heat up a pan oer medium high heat. Add some oil and pan fry the tofu. When fried remove the tofu and the oil. Add some of the mariade to the pan and then add the tofu. Cook until the tofu absorbs the mariade about 1 minute. 1 tablespoon of apple cider vigear. Heat a pan to medium heat. Add some oil. Add the shallot and ginger and saute for about 2-3 minutes until softened. Add the apple cider and vinegar. Cook for about 7-10 minutes. Add the apples and cook for 1-2 minutes. I overcooked by reheating them but I think its best for them to remain with a little bite. I wanted to make one more thing because one dish is not enough for me, so this morning I made some waffles! I made some Apple-Ginger Waffles which were inspired by the Ginger-Pear waffles from vwav. I served the waffles with a Sweet Gingered Apples. The waffles were really good! I enjoyed them alot! Sift the dry ingriendents in a large bowl. In another bowl mix the juice, soy milk, sugar, oil and vanilla. Make a well in the dry ingriendents and add the wet mixture. Mix until combined and add the grated apples. Make the waffles according to the manufacturer’s directions. I have been absent for a while but I am back!! 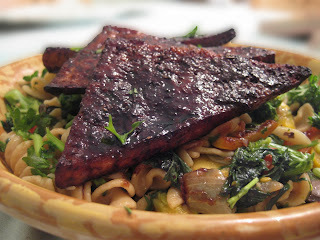 I always wanted to create a Blasamic Glazed Tofu dish!! And I did! Last night I made this tofu and it was good, it was a bit bland in the middle because I didn’t press long enough. I am still working on this recipe. I served it over some pasta primavera!!! When I perfect the recipe I will post it up! 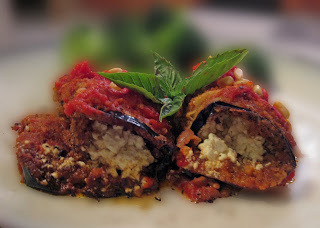 I made some Eggplant Rollantini from V’con! These were really good! I wish I had the spinach though. I had a lot of eggplant this week as you will see!! A creation of mine!! 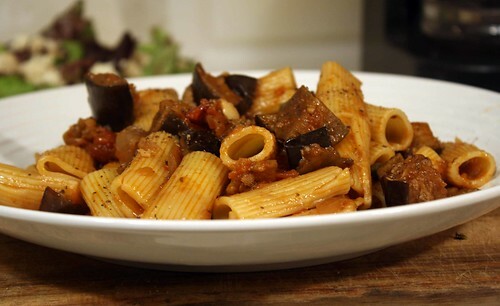 Rigatoni with Eggplant “Croutons”! This was fairly simple to make. I breaded and fried the eggplant. I then got some of my homemade marinara sauce heated up and cooked some rigatoni. and then threw that all together. 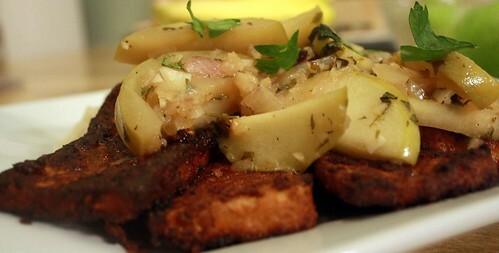 Then topped it off with these Eggplant “Croutons”. Very good!! 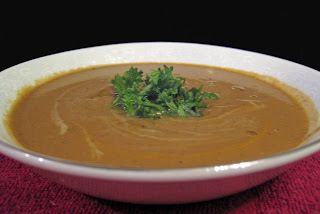 This is a Roasted Eggplant Soup. I got this recipe from The Mediterranean Vegan Cookbook! This was a very good soup. I have started using this cookbook a lot more it gives me a lot of inspriation! 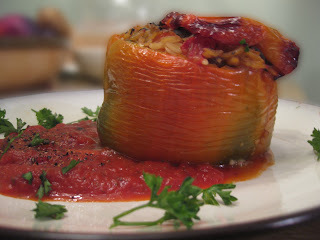 Orzo Stuffed Peppers- I loved these peppers! 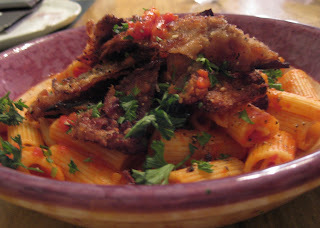 I adapted this recipe from the Mediterranean Vegan Cookbook. I added some more vegetables to the orzo filling. This is really simple to make and very tasty!! I have a new food blog! Check out these Food Blogs!